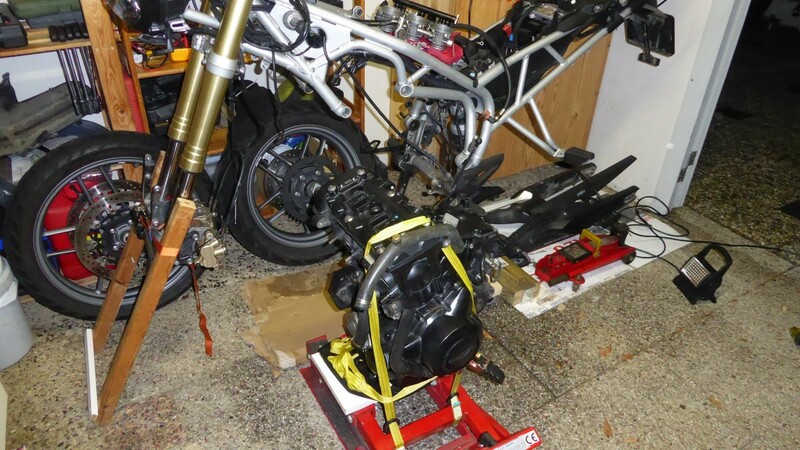 I can tell you that it is not easy to remove the engine all by yourself, because you first have to raise the frame at the rear and lower the frame at the front to "free" the rear engine mounts, before you can lift the frame over the engine or lower the engine from under the frame with a motorcycle jack. 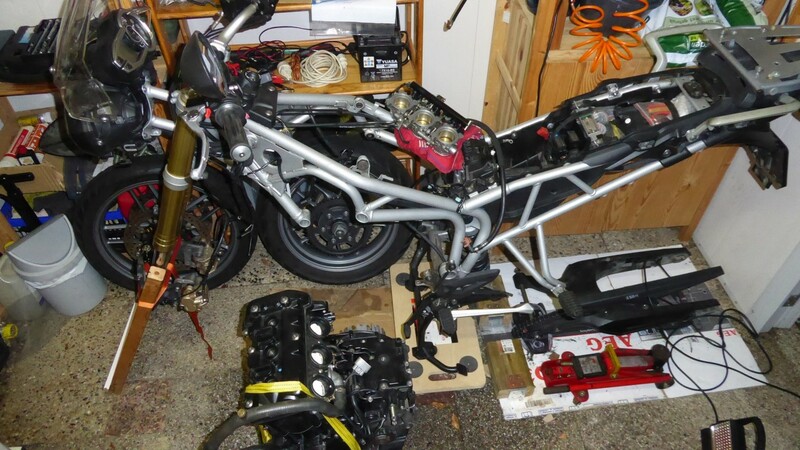 I will make pictures when i managed to find a way to remove the engine on my own. 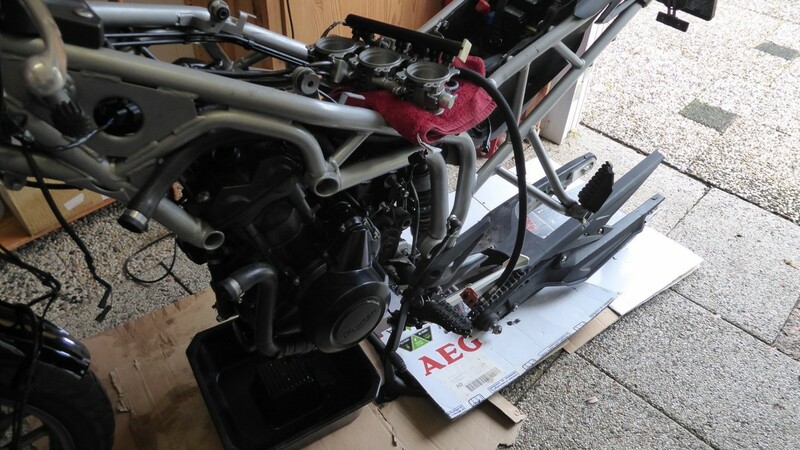 After some hours of experimenting, i managed to remove the engine on my own, using a motorcycle jack to support and lower the engine. 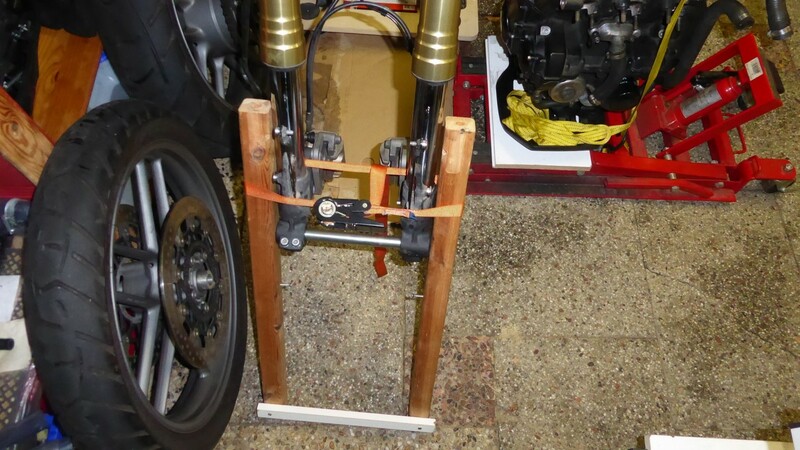 First i raised the rear of the bike by putting thick wooden blocks under the centerstand. I also raised the front by removing the front wheel and using a simple wooden construction to support the raised up front. This way the engine was located high enough from the floor, so i could use a motorcycle jack to lower the engine from under the frame and pull it away. 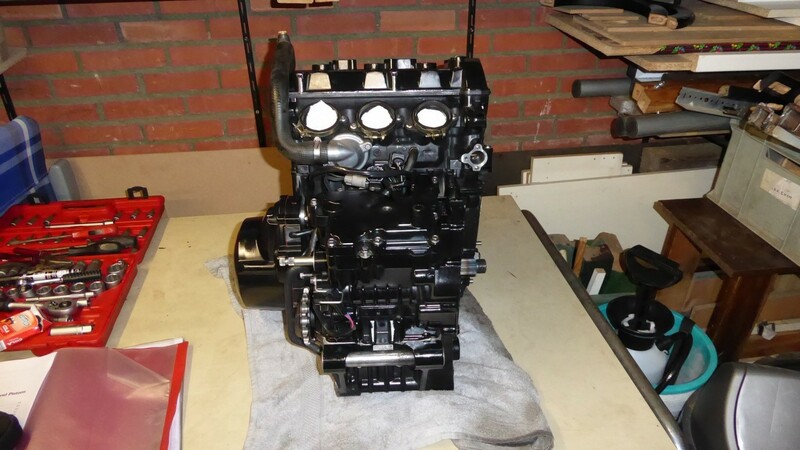 I'm glad i only put one tiny scratch on the engine while messing around to get it removed, because it took quite some experimenting before i could lower the engine vertically without scratching the engine against the engine mounts or without touching other parts at the back (the gear box. The engine is standing on the sump guard and i used a strap to keep the engine upright. 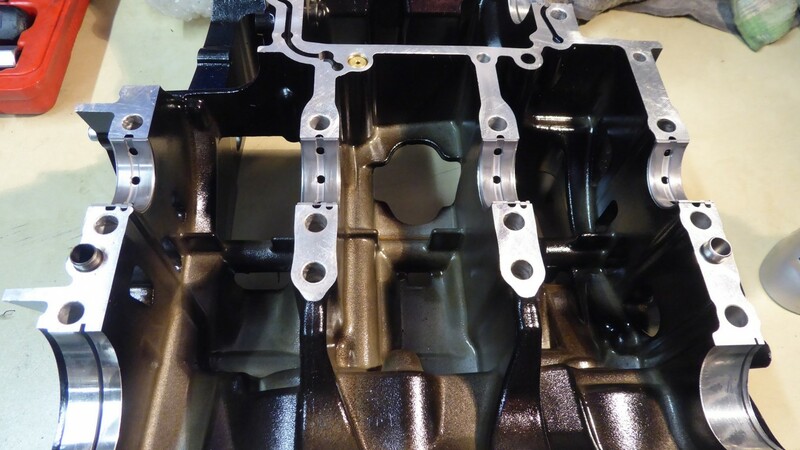 The engine has a tendency to fall to the right, because of the empty space where the exhaust was, where the sump guard is not supported and connected to the engine. 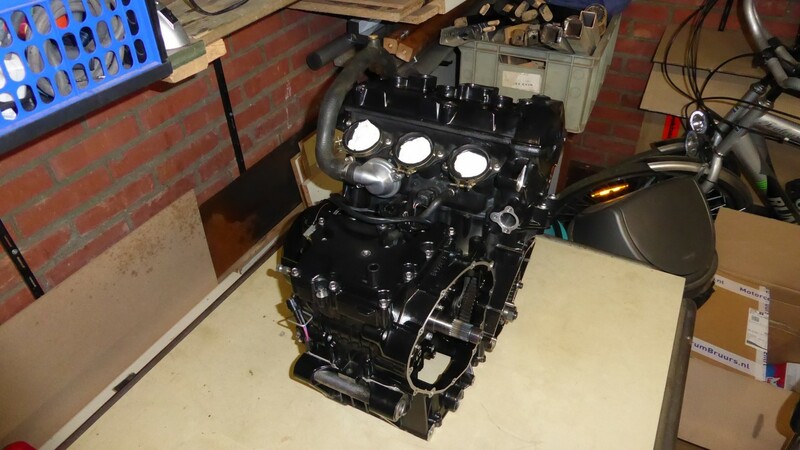 Great job Roel, you must be well chuffed to finally get your engine separated, and especially doing it on your "Pat Malone". Isn't it amazing how much garage 'real estate' gets swallowed up by all the 'gubbins' removed when you pull a motor out. Good luck and we'll be looking over your shoulder on this journey. Keep at it and thanks for sharing so eloquently. Thank you Gerdy. Your moral support is appreciated. I'm glad i got this far without getting into more problems. 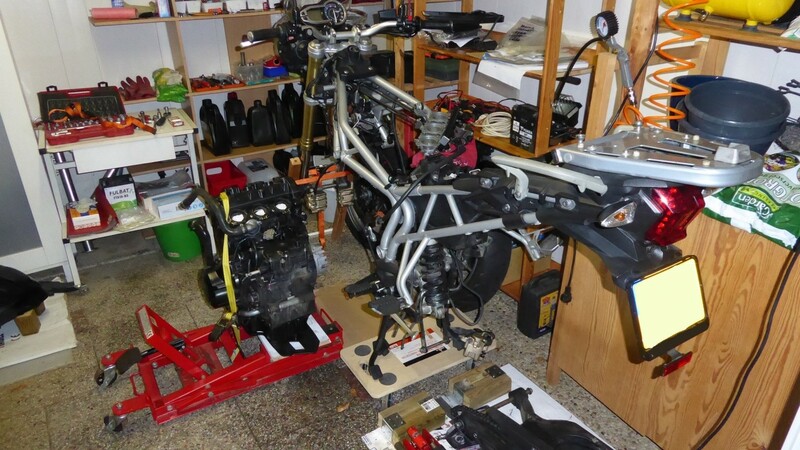 Yes, i will try to get the engine up on a wooden table/bench, so i can work while standing upright. I'm also very curious if i will find an obvious reason for the low oil pressure inside the engine. I will keep posting. 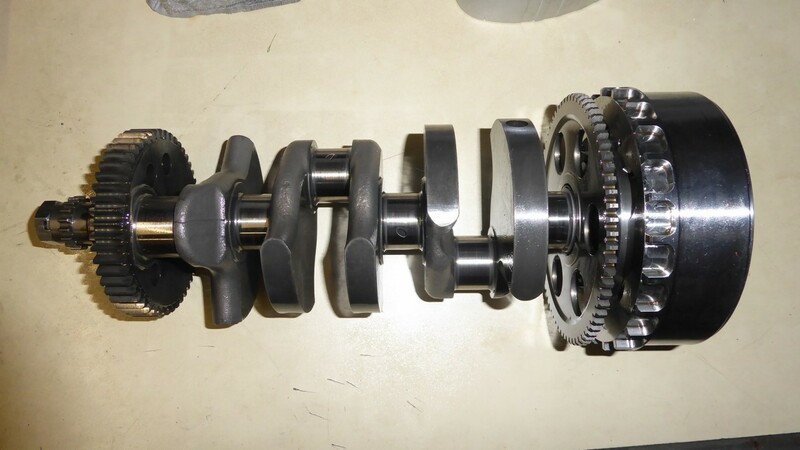 Close-up of the crankshaft. Right is the alternator magnet. 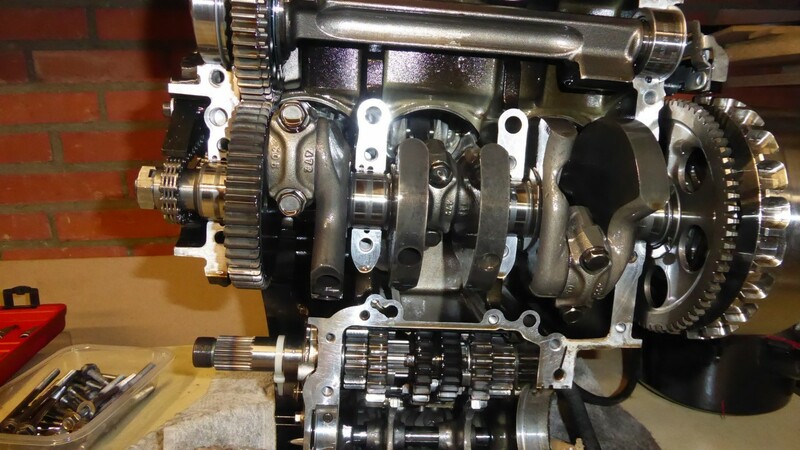 Left is the balancer sprocket and far left the camshaft chain sprocket with the cam chain. The gray stuff in the middle of the journals probably is the left-over of the molybdenum disulphide grease that was used in the factory when the crankshaft was installed. Close-up of the big end and the main crankshaft bearing shells. cylinder 1 is right, cylinder 3 is left. There is a scratch on the big end bearing of cylinder 1 and also on the big end bearing of cylinder 3. Close up of the big end bearing shells seated in the big end caps. Left is the cap of cylinder 3, right is the cap of cylinder 1. I found a scratch, that can be felt when rubbing a fingernail over it, on the main crankshaft bearing between cylinder 2 and 3. But i'm not sure if the scratch was there, or if i caused it while putting the crankshaft in and out. 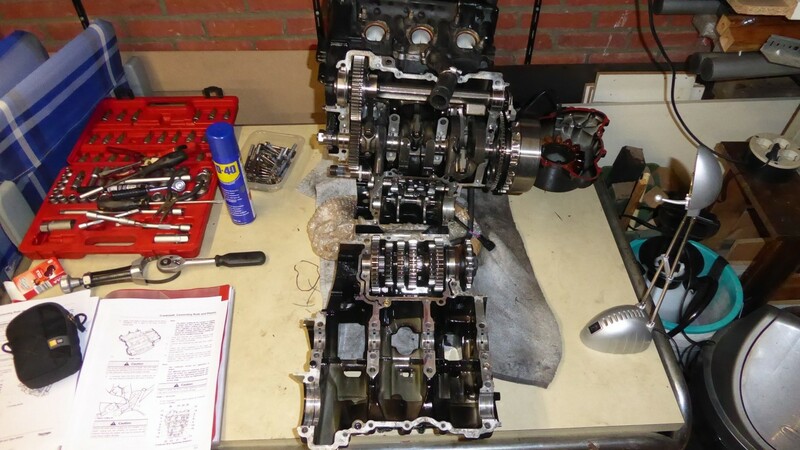 I did a plastigauge (the green one) check on all the crankshaft bearings (main and big end). main bearing clearance is already at the wide side. I'm not sure if that would result in an oil pressure that is 0,5 to 1 bar lower than normal. while i measured the clearance in the middle of the shell with the plastigauge. I'm not an expert at all, so i might be talking non-sense here. To be sure, i'm going to do measurements using a micrometer on all the main and big end bearings and crankshaft journals. And not only in the middle of the bearing shell, but also at the sides, to see if there is an oval wearing pattern (if that is possible at all. I'm thinking of imbalance of the crankshaft). 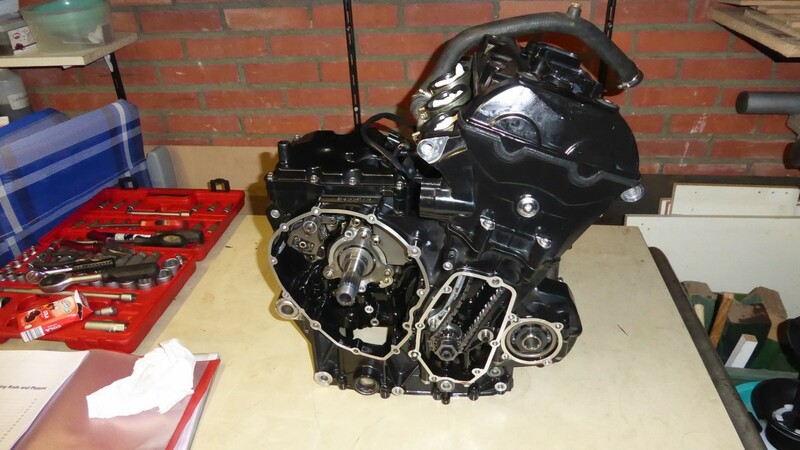 At the end i will replace the crankshaft and all the bearings anyway, because i hope to fix the problem once and for all. 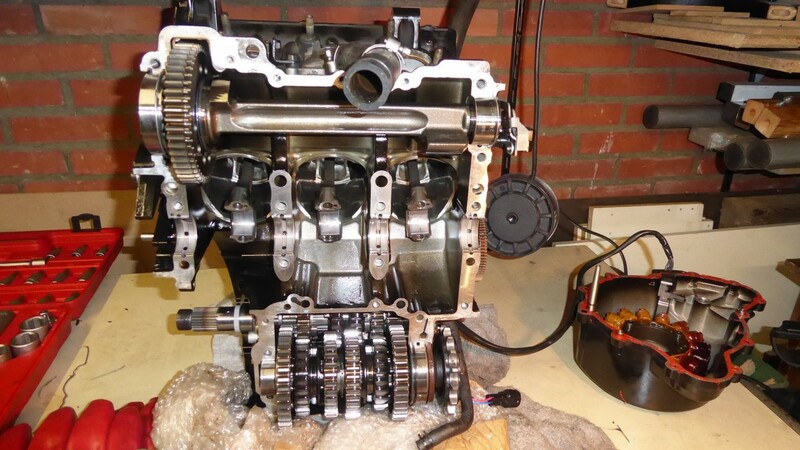 I see you plan to replace the crankshaft -- will you put it on v-blocks or within centers and check for run-out? 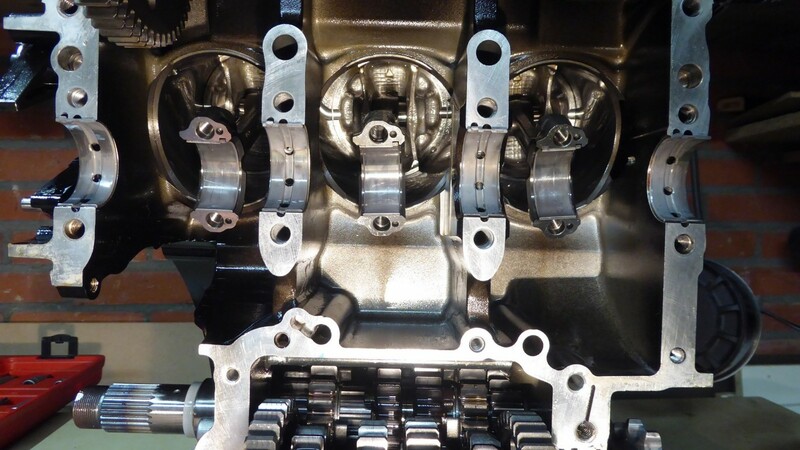 Will you be checking the camshaft bearing clearances? "V-blocks" (in fact U-blocks). Maybe that way i'm able to measure the run-out, because i don't have V-blocks or a lathe with centers to hold the crankshaft. and the bearing shells installed. I will measure the inner shell diameter left, middle and right in the middle of the shell but also perpendicular to that (side of the shell). This will give me the clearance and also any deformation will show. Maybe i can also measure the thickness of the shell to find deformations. I guess i have to watch some more youtube video's to get some more idea's/tricks on how to measure the clearances. Good progress for sure Roel. Many years ago on my first time at the plasti-guage rodeo, I munged it up big time and thought the clearances were spot on. They weren't. Nothing against plastiguage - I'm sure they are good in the right hands - just not mine. The clearances were too large and although it brought up oil pressure when cold, unbeknown to me, the crank was flapping around big time. 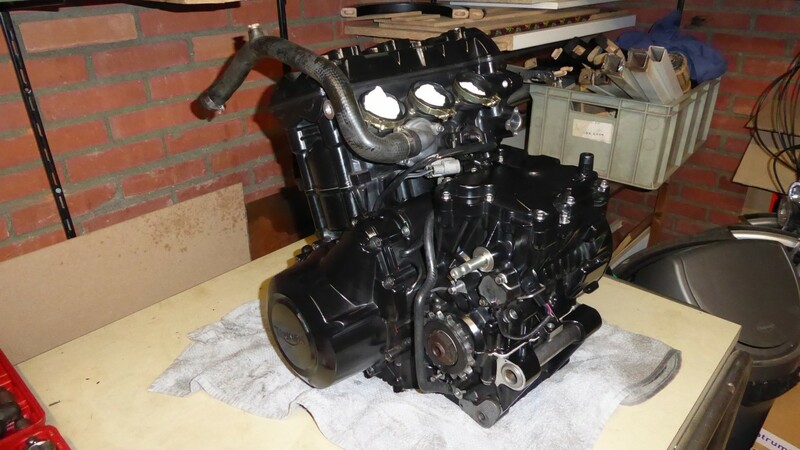 A decade or more later I had the measurements taken by an engine builder on a different example of the same engine (a '78 6 cyl. Honda CBX) because I wanted hard data I could really trust. All good this time. IMHO, it's a bit too much of a coincidence your big end and mains measurements are EXACTLY the same, down too 100th of mm? Not sayin' it can't happen, but what are the chances? 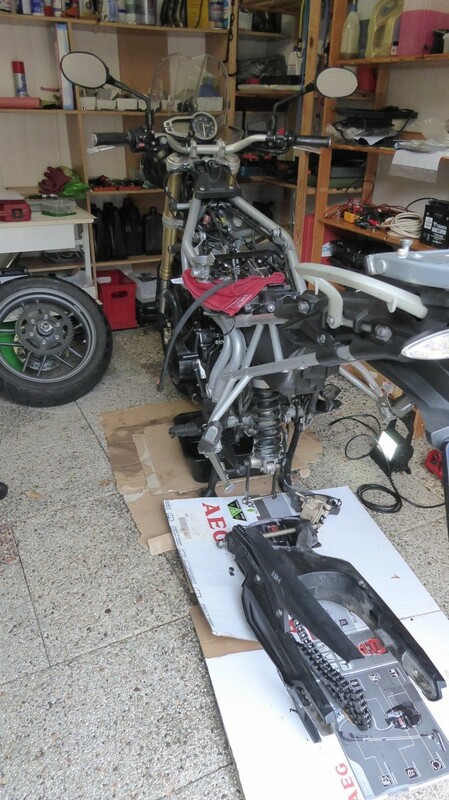 Not sure if Triumph do this, but on Hondas they have diffferent size (thickness) bearing shells. May be worth exploring. Is there a chance the crank on yours could have been changed already and just 'dropped' in on top of the original bearings. 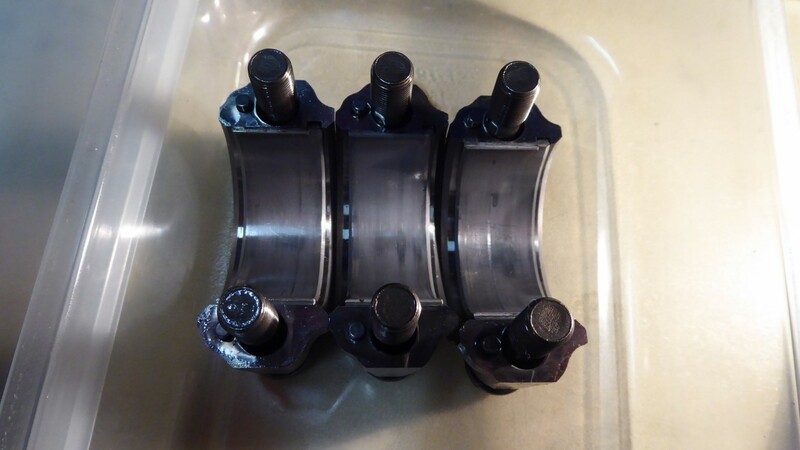 Whatever crankshaft goes in, be surgically clean and vigilant about cleaning out the oil galleries within the crankshaft. Some blind galleries may have a ball bearing or similar plugging mechanism to block them off. Think about extracting them and tapping in a threaded blanking plug, red loctite would be your friend. The amount of sludge that builds up in them is a real eye opener! Good luck and keep fighting the good fight - you WILL prevail! The plastigage measurements are exactly the same because the plastigage test only gives you 4 clearance marks : 0.025, 0.038, 0.051 and 0.076 mm. All clearances were closer to the 0.038 mm mark than to the 0.025 mark. It is a very coarse test and no gurantee. I think it tells you : don't worry, worry, panic, cry. i will do proper measurements with a micrometer anyway, because that is the most precise way. 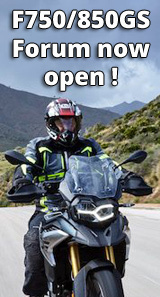 Triumph also has different sizes of bearing shells to get the correct clearance depending on the crankcase/connecting rod bore diameter and the crankshaft journal diameter.